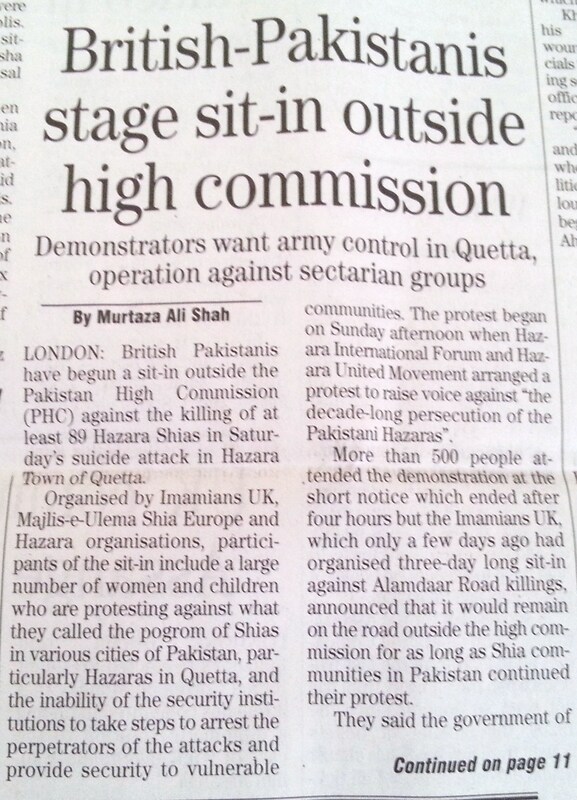 The UK Times covered the interactive debate on the Genocide of Pakistani Hazaras, taking place in the House of Lords on 25-03-2013. 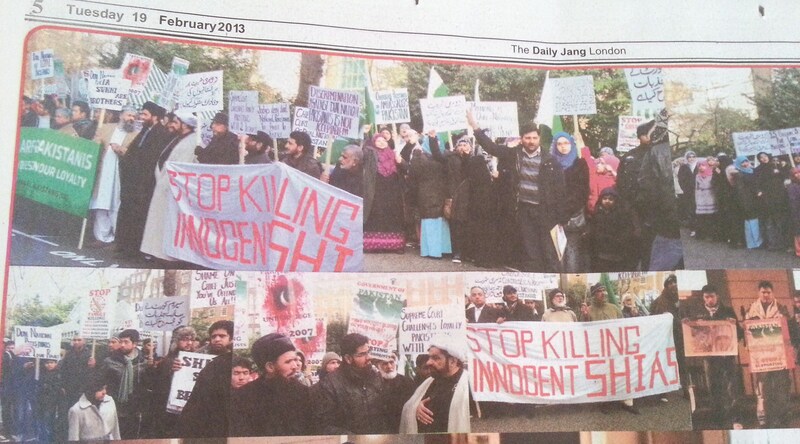 Jang Open Forum, London organised an interactive debate about the Genocide of Hazaras and Shi’ites of Pakistan. 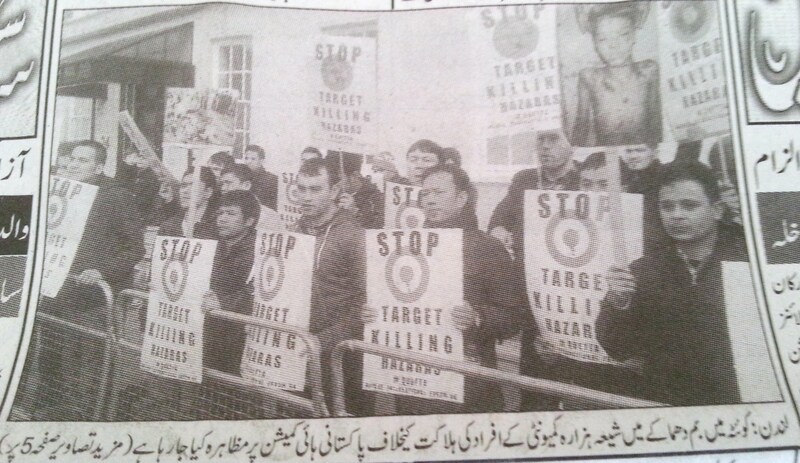 Jang Open Forum, London organised an interactive debate about the Genocide of Hazaras and Shi’ites of Pakistan in its local office. 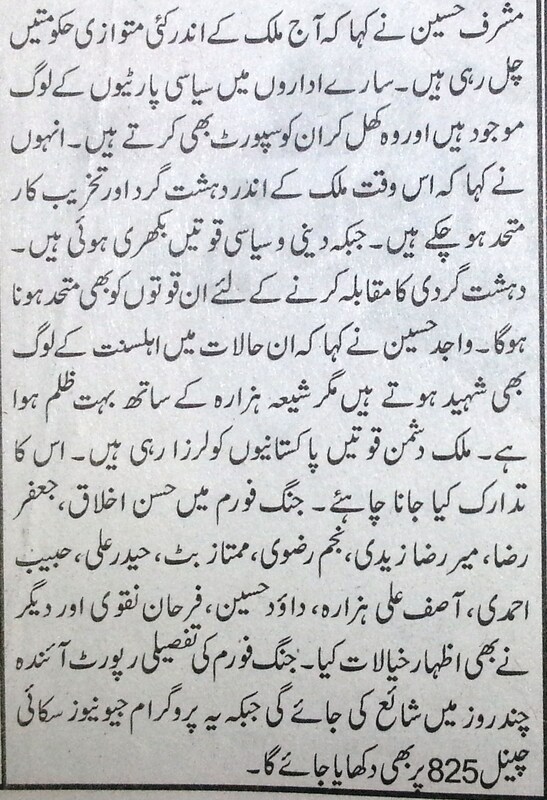 Mr. Iftikhar Qaiser, Jang Editor hosted the show which is also televised on Geo TV in Europe and North American on Sky Channel 825. 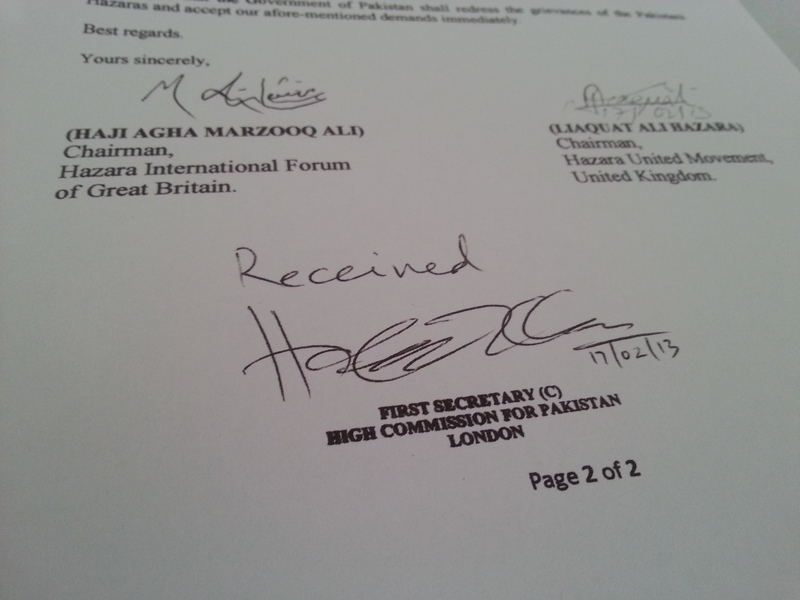 Posted in United Kingdom (General) and tagged Jang Open Forum. Bookmark the permalink. 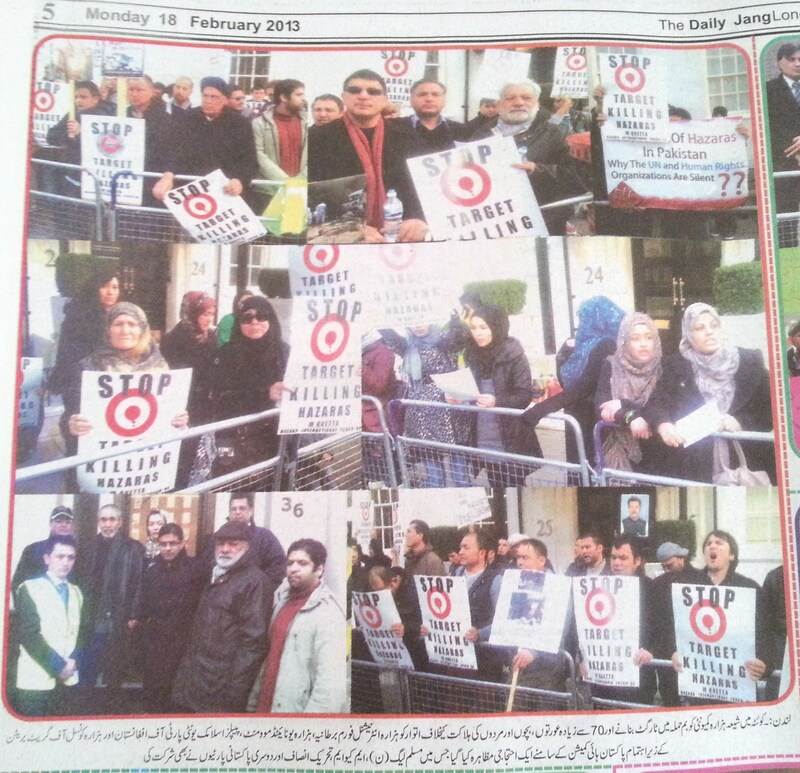 Coverage of London Protest by other media channels. 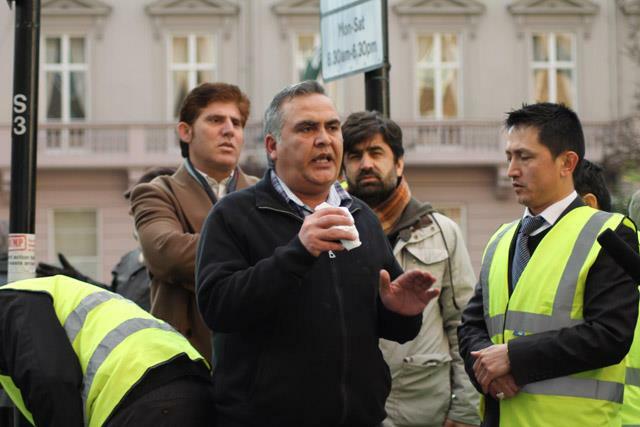 Below are the photos and publication of international media channels regarding the 17th February, 2013 protest in front of Pakistani High Commission, London. 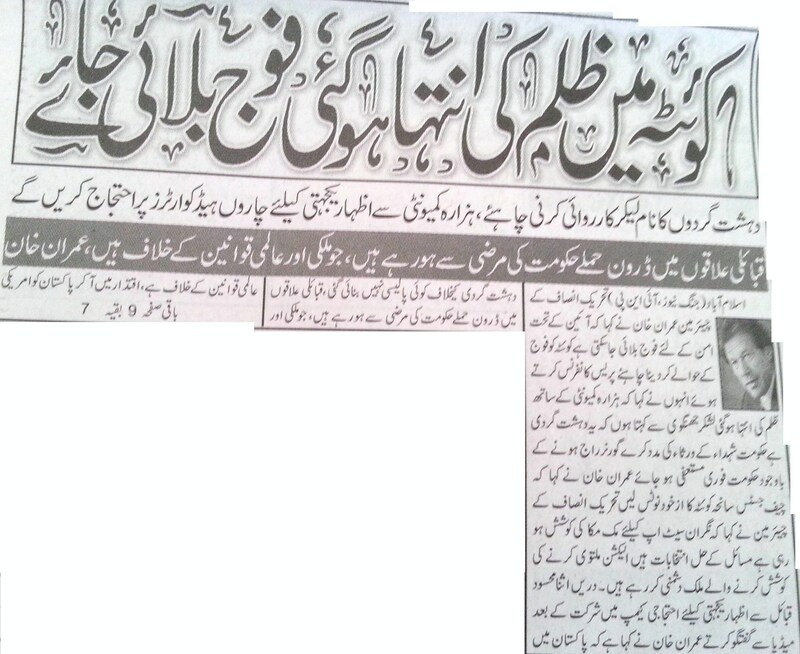 Statement of Imran Khan, Chairman Pakistan Tehreek-e-Insaaf. 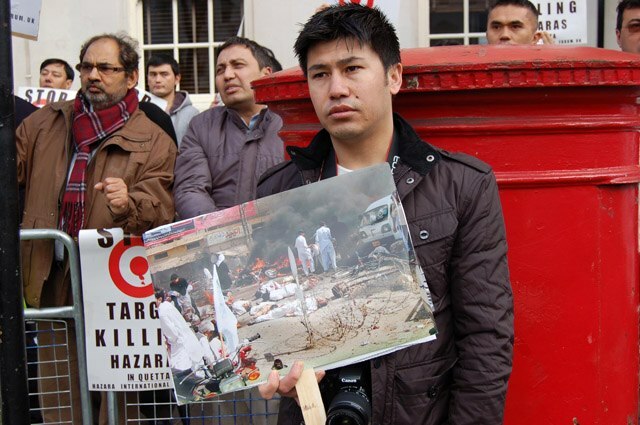 Members of UK Civil Society and members of House of Lords condemning Hazara Town bomb blast. 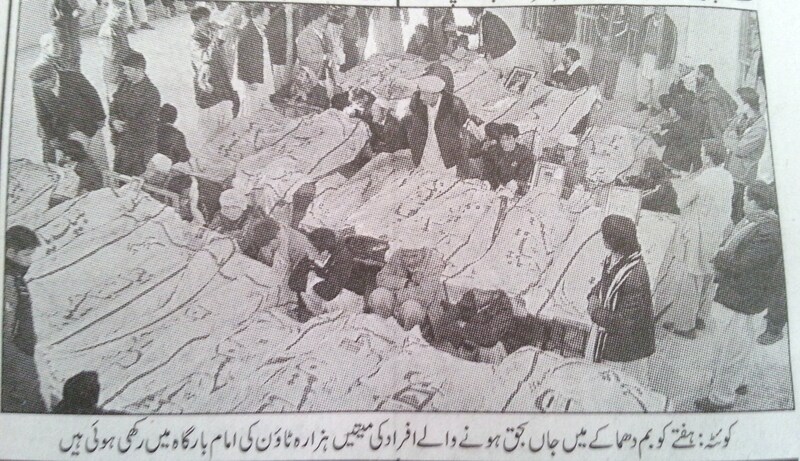 Dead bodies of the Hazara Town incident, lying in a local Imam Bargah in Quetta. 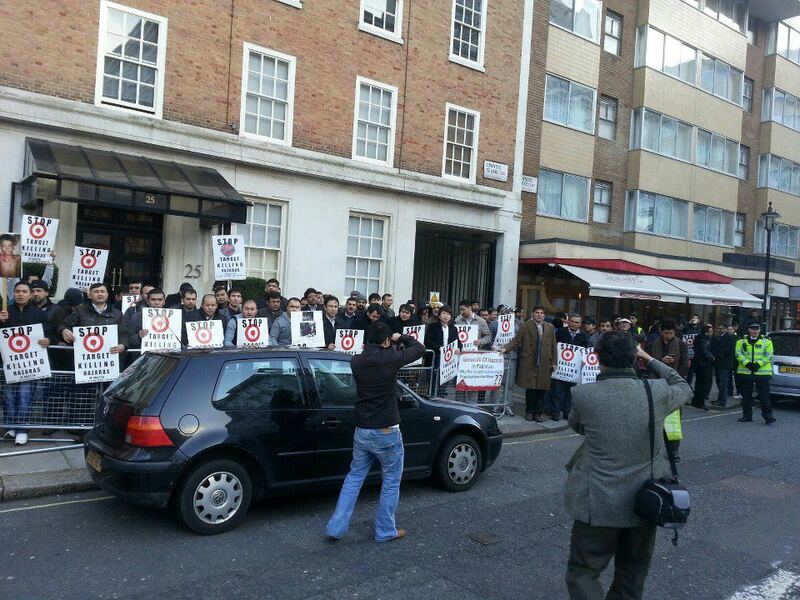 Sit-in Protest in front of Pakistani High Commissioner in London against the Hazara Town Carnage. 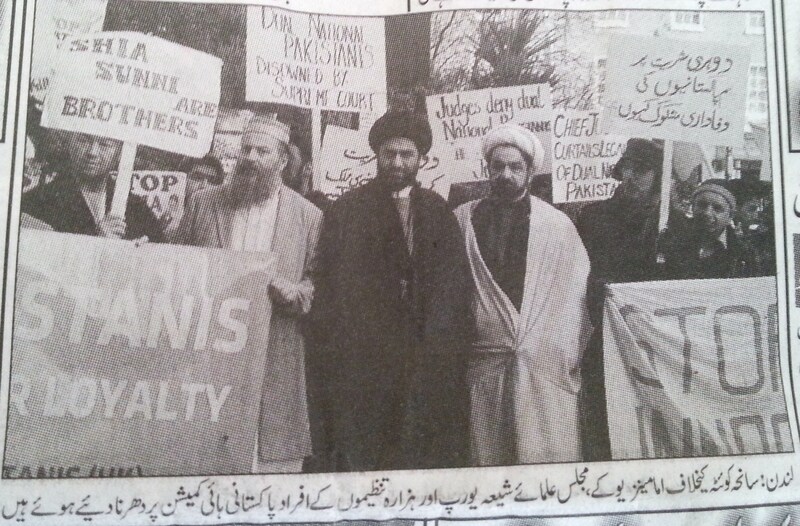 Posted in Protests and Demonstrations, United Kingdom (General). Bookmark the permalink. 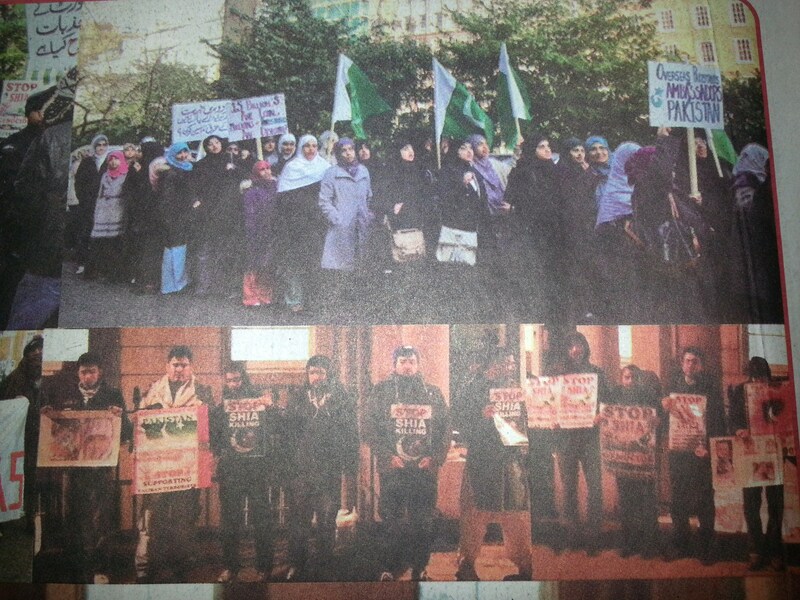 Protesters in front of Pakistan Embassy London. 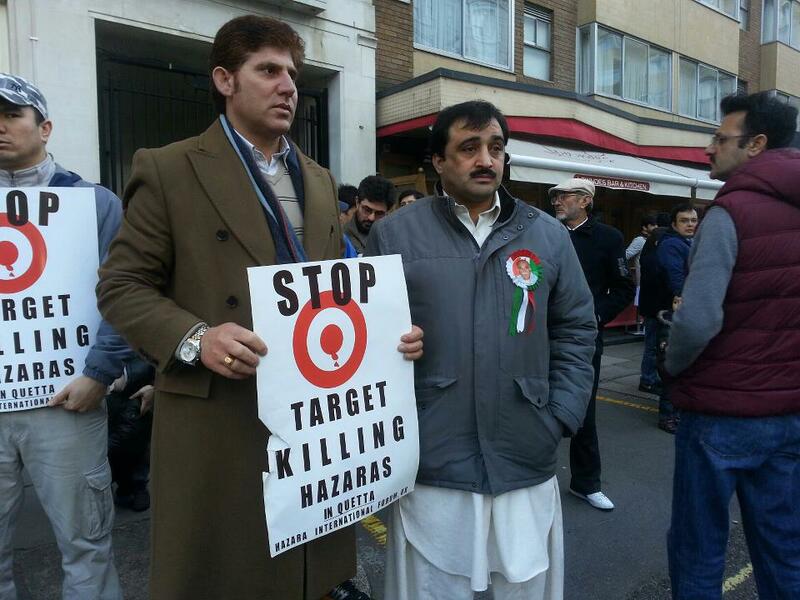 Hazara International Forum of Great Britain and Hazara United Movement, United Kingdom organised a peaceful protest in front of Pakistan Embassy, London on 17-02-2013 to raise voice against the callous bombing of Kirani Road which had killed over 84 innocent people and injuring more than 200 others. 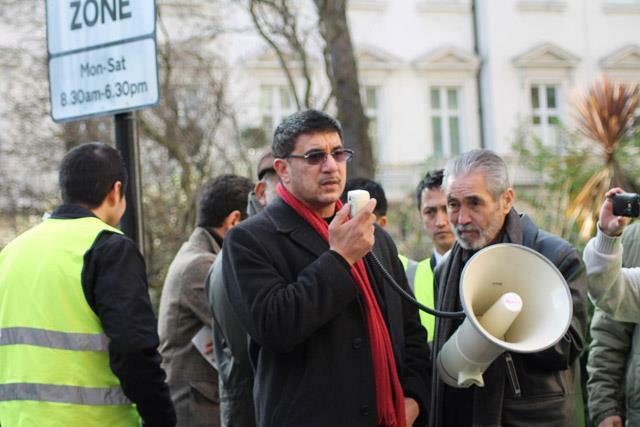 The protest started at 12:00 noon with the recitation of the Holy Quran by Haji Marzooq Ali. 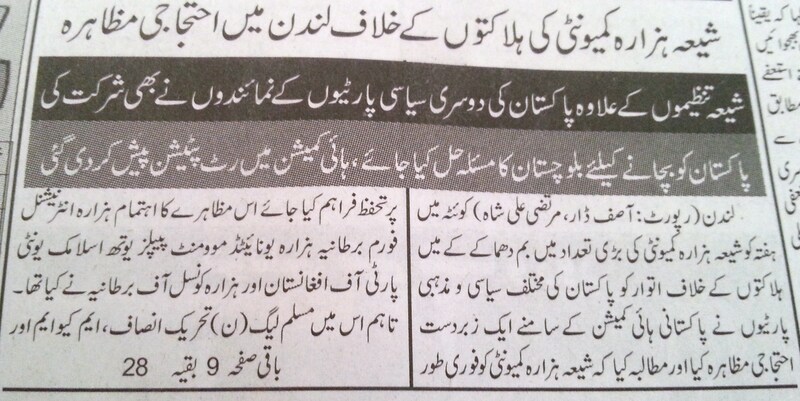 The organisers, then, started shouting loud slogans in English and Urdu. 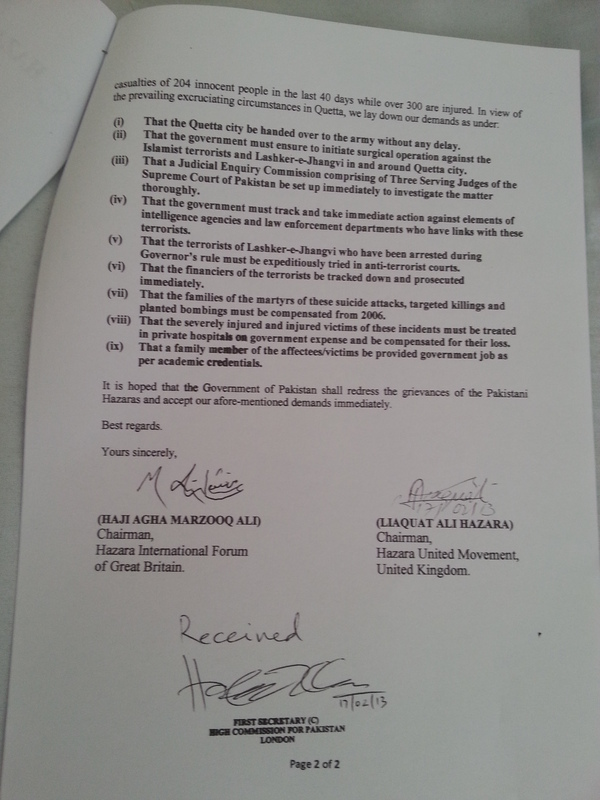 The slogans denoted the Chief Justice of Pakistan, the Army Chief and the Government of Pakistan to take serious action against the perpetrators, their financiers and sympathisers. 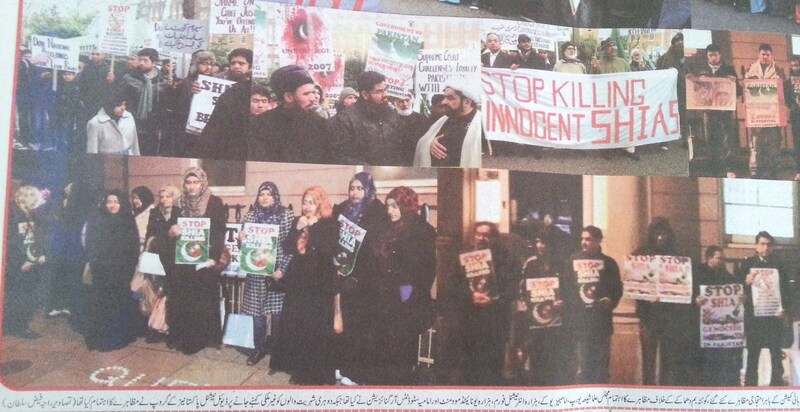 Hundreds of people participated in the protest including women and children. 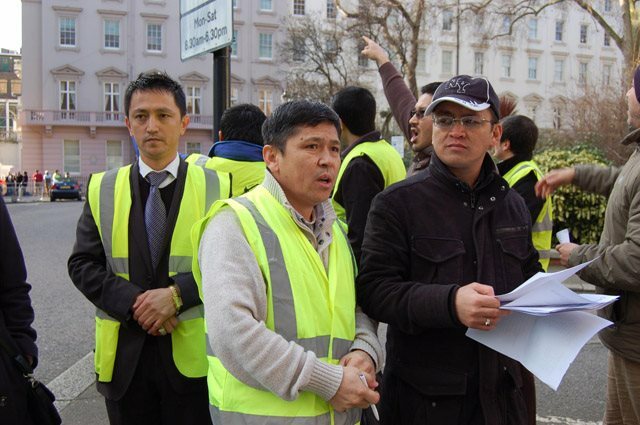 The on-going persecution of Pakistani Hazaras has compelled everyone to come to streets and hold protests to raise strong and unified voice against it. 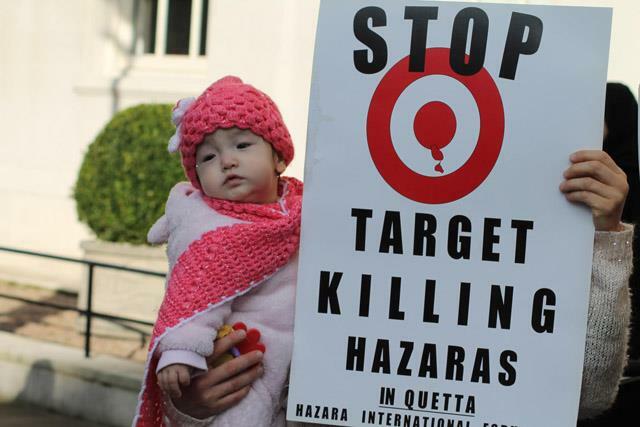 The cold-killing of this ethnicity is continue since 1999 and thousands of innocent people have been targeted in south-western city of Pakistan’s Balochistan province. 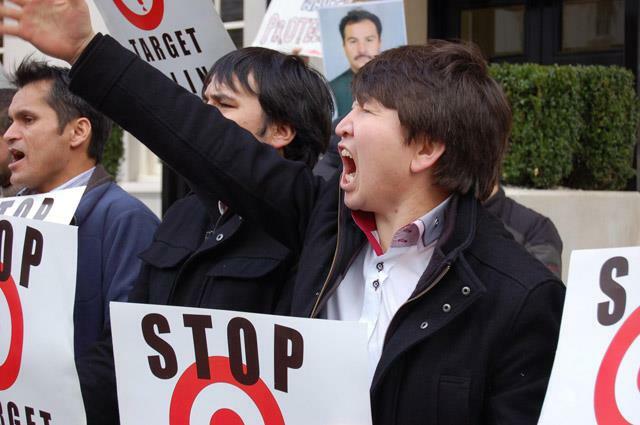 The repeated incidents of targeted killings and suicide and planted bombings have taken the lives of over 1500 Shi’ties while 1200 of them belong to the Hazara tribes. Over 4500 have been injured and about 65% of them are critically injured. 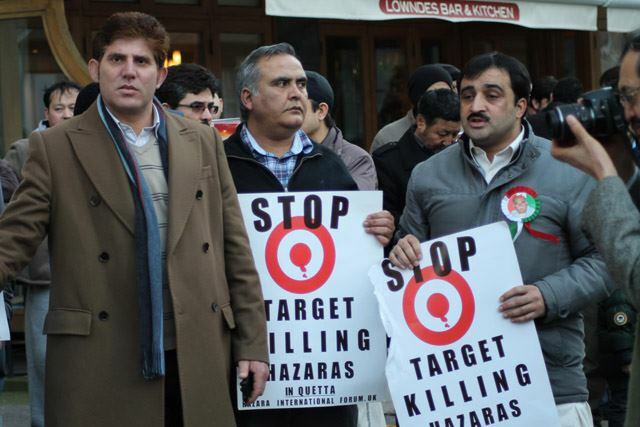 Pakistan’s mainstream political organisations such as Pakistan Tehreek Insaaf, Muthahida Qaumi Movement, Pashtoonkhawa Milli Awami Party and Pakistan Muslim League (N) also joined the protest to show their support and solidarity with the Hazaras. 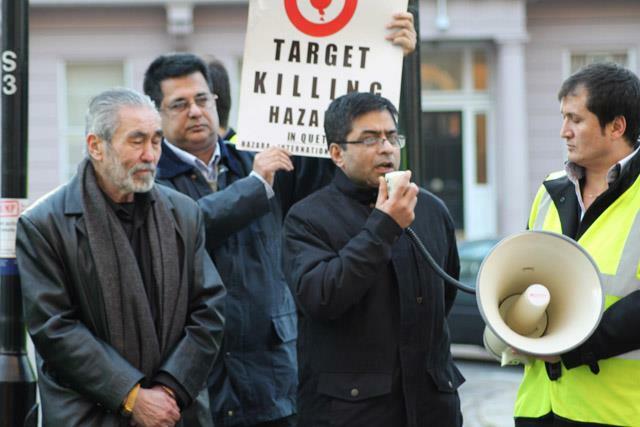 The speakers included Haji Agha Marzooq Ali (Chairman Hazara International Forum of Great Britain), Liaquat Ali Hazara (Chairman Hazara United Movement, United Kingdom), Habib Ahmedi (General Secretary HIF), Maulana Abbas Haider (Majlis Ulama Shi’ite, Europe) and Maulana Musharraf Hussaini (MUS). The other speakers include Dr. Saleem Danish of MQM, Amjad Khan of Pakistan Tehreene-e-Insaaf and Akbar Khan Kakar of Pakhtoonkhawa Milli Awami Party (PMAP). 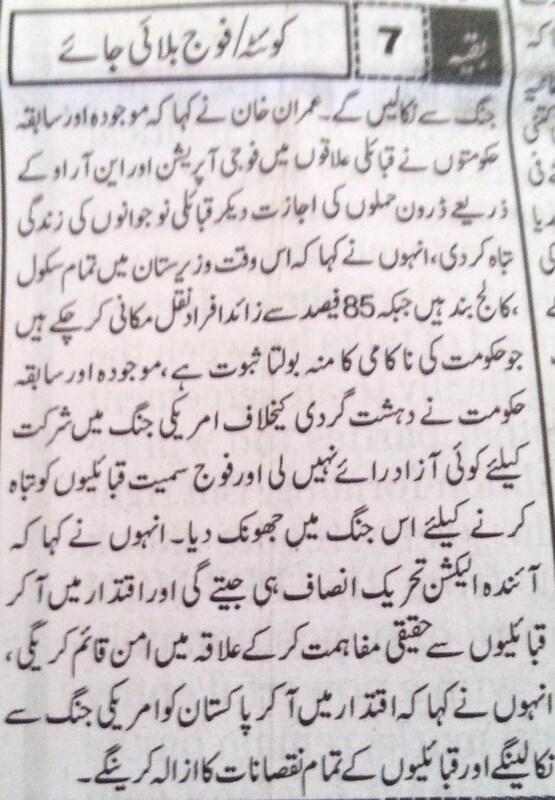 Amjad Khan of Pakistan Tehreek Insaaf said that he had come to participate in the protest on special directives of the PTI Chief, Imran Khan who had asked him to attend it by all means. 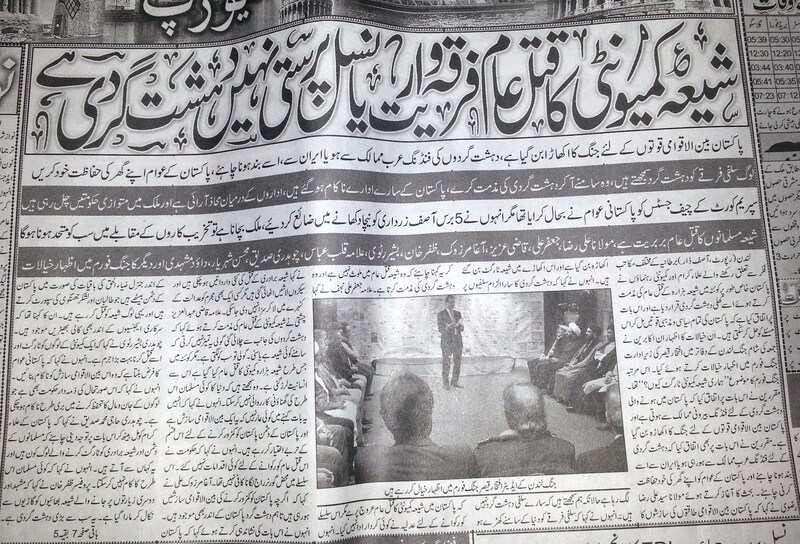 “PTI will raise voice on all forums against persecution of Hazaras. 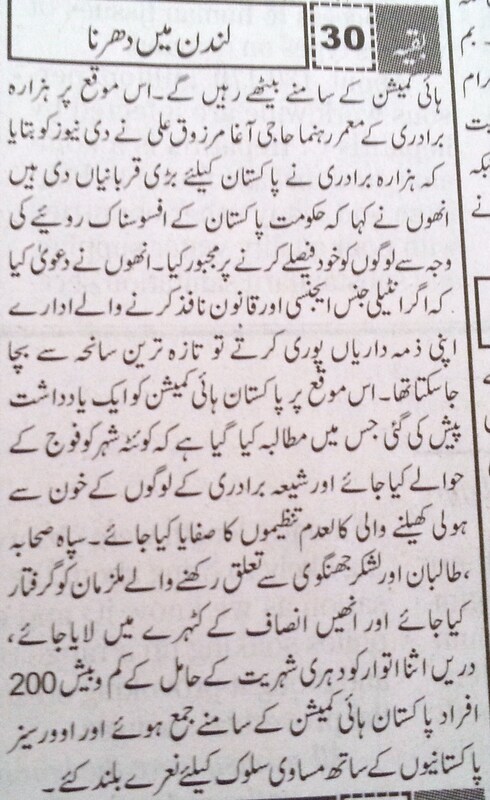 If PTI wins the next general election, it will wipe out terrorism and religious extremism from the country. 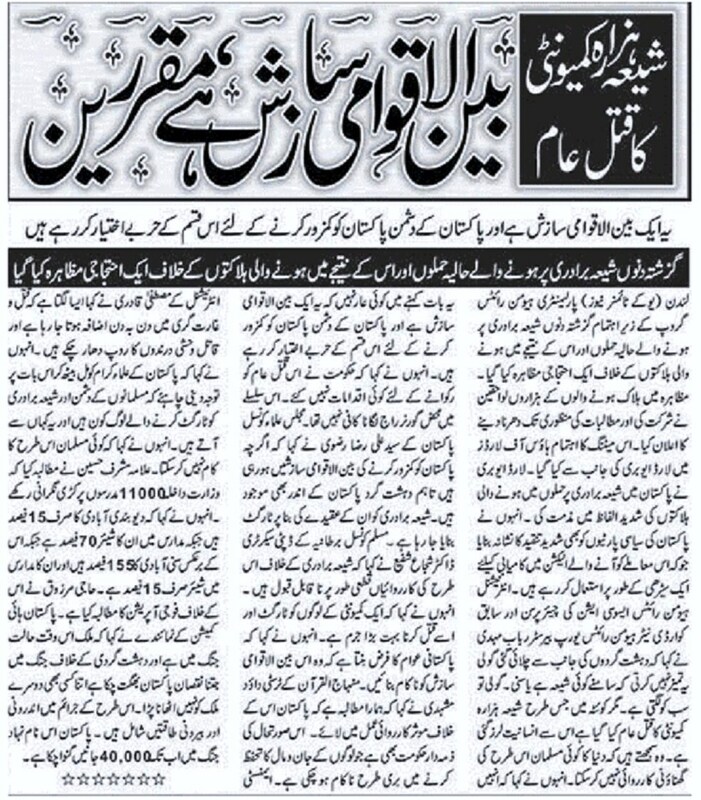 The government has completely failed to provide security to the people”. 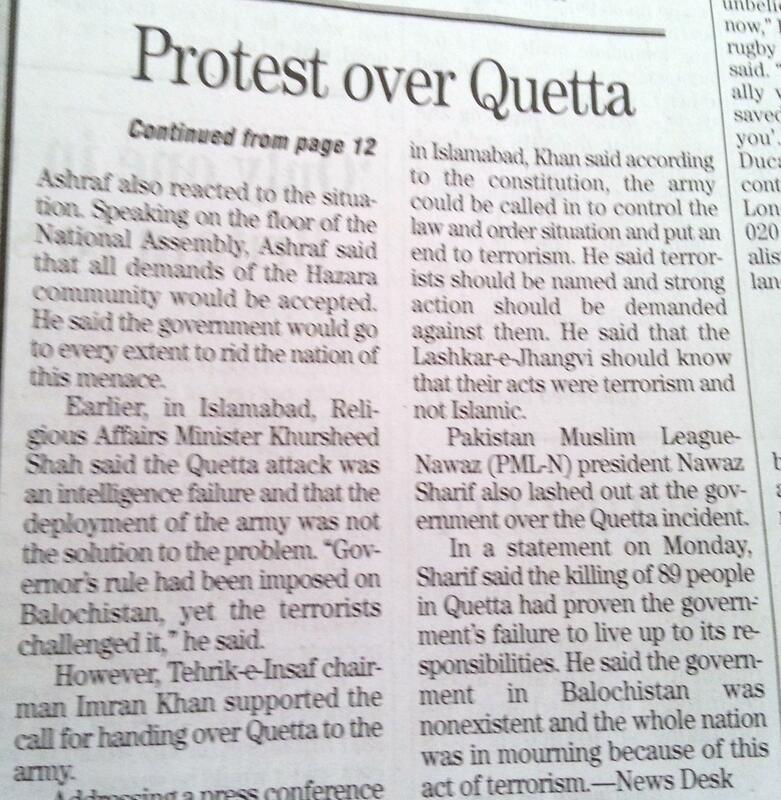 (i) Quetta city should be handed over to the army without any delay. 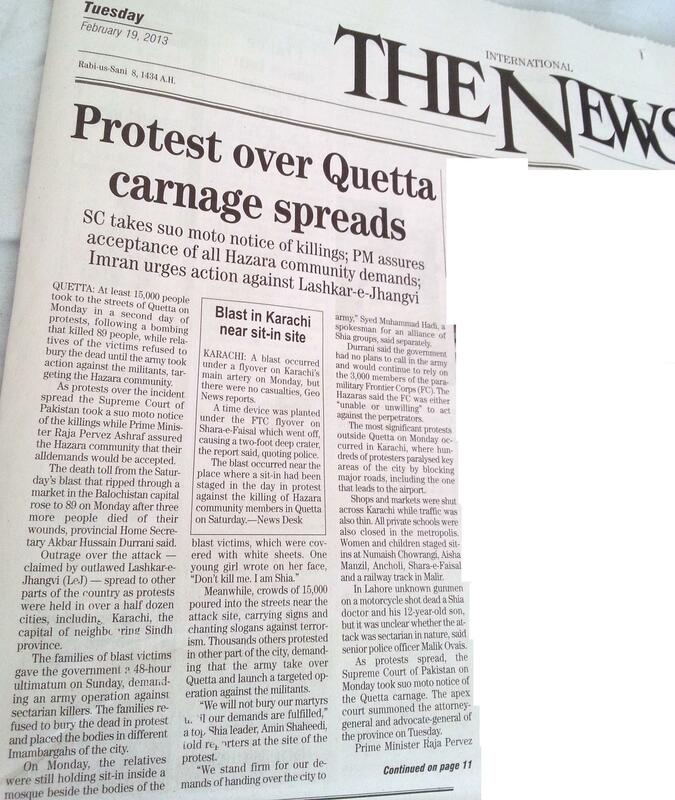 (ii) That the government must ensure to initiate surgical operation against the Islamist terrorists and Lashker-e-Jhangvi in and around Quetta city. 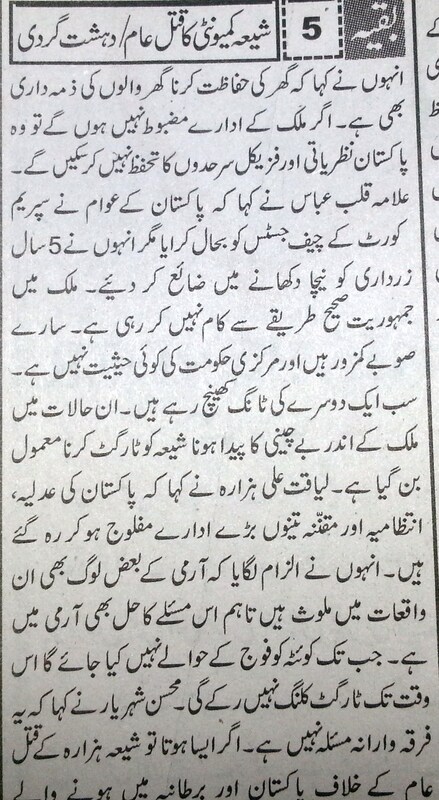 (iii) That a Judicial Enquiry Commission comprising of Three Serving Judges of the Supreme Court of Pakistan be set up immediately to investigate the matter thoroughly. 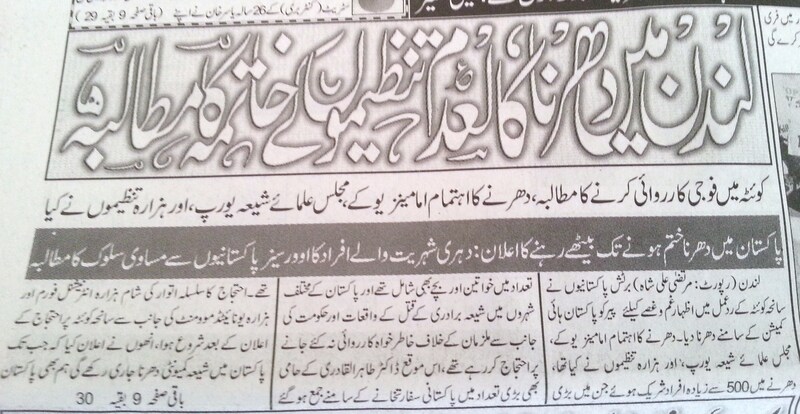 (iv) That the government must track and take immediate action against elements of intelligence agencies and law enforcement departments who have links with these terrorists. 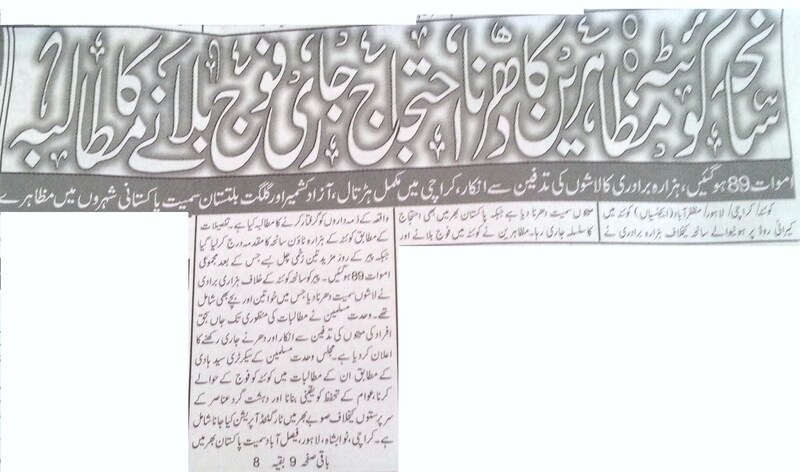 (v) That the terrorists of Lashker-e-Jhangvi who have been arrested during Governor’s rule must be expeditiously tried in anti-terrorist courts. 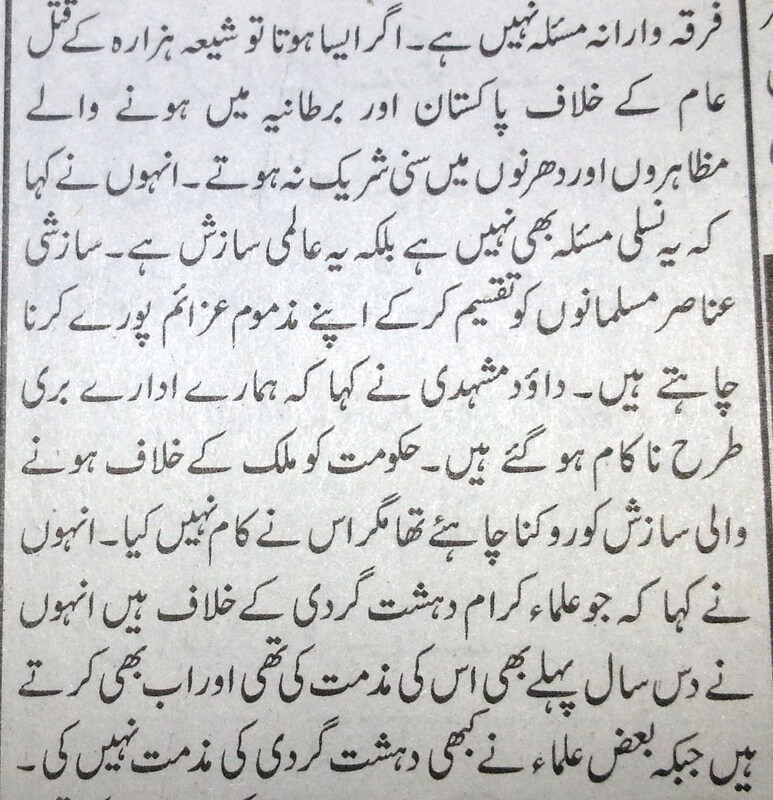 (vi) That the financiers of the terrorists be tracked down and prosecuted immediately. (vii) That the families of the martyrs of these suicide attacks, targeted killings and planted bombings must be compensated from 2006. (viii) That the severely injured and injured victims of these incidents must be treated in private hospitals on government expense and be compensated for their loss. 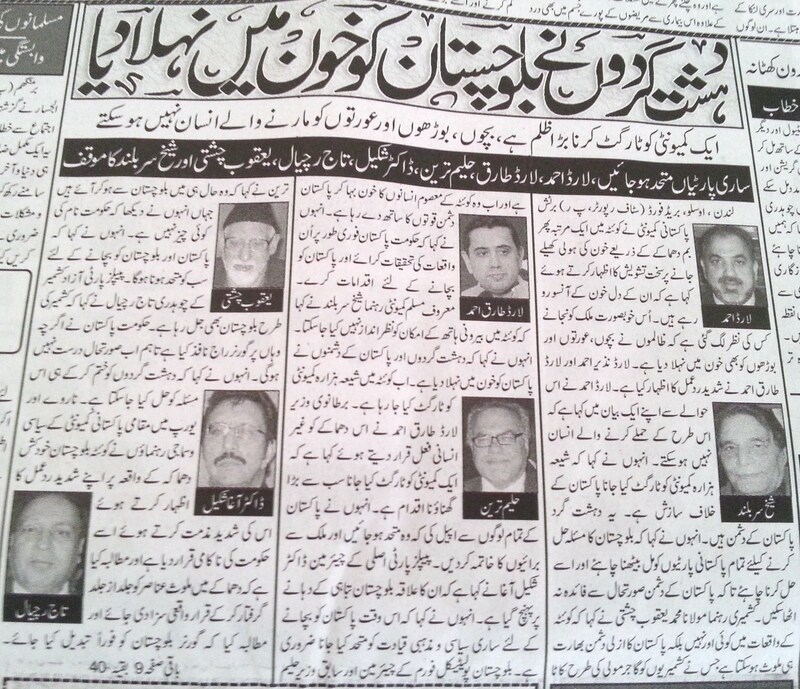 (ix) That a family member of the affectees/victims be provided government job as per academic credentials. 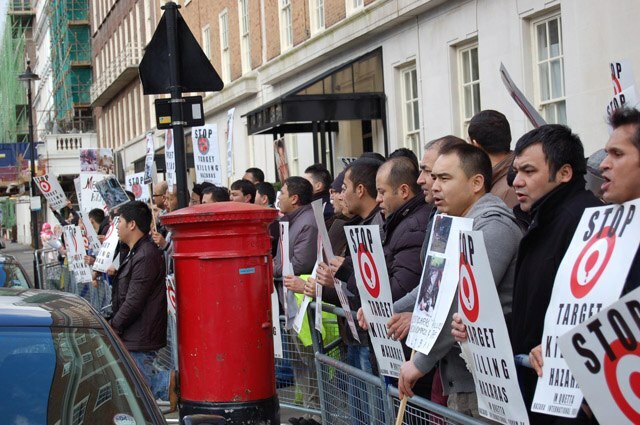 Posted in Protests and Demonstrations, United Kingdom (General) and tagged Genocide of Hazaras, Hazara United Movement, HUM, London, London Protests, Protest in front of Pakistan Embassy. Bookmark the permalink.